Roman style is foreign to the Chinese. 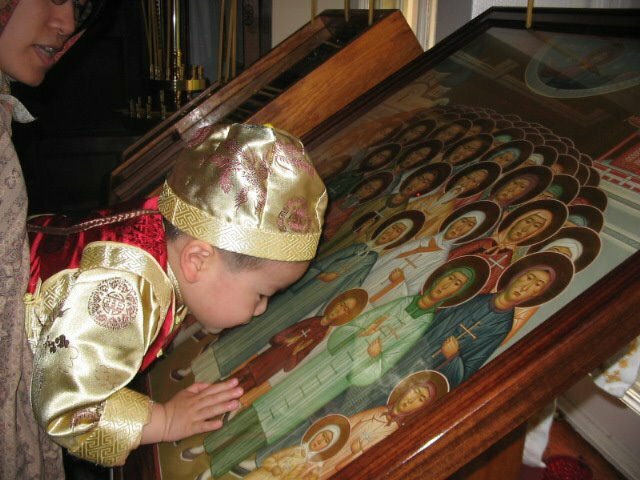 By posting these images are you saying that eastern peoples are also worshiping at Western churches? I grew up in a "western background" (hate the "east/west" dichotomy) and had no problem at all integrating into my Bulgarian parish. Being subject to wacky post Vatican II liturgics made the Constantinopolitan tradition more than a breath of fresh air. I have nothing against WR Orthodoxy. The Spirit moves everyone where He wills. The East/ West divide is exaggerated and is getting more irrelevant every day. Westerners going to Eastern liturgy is just fine. They say a picture is worth a thousand words, but in this case, just five for you: "I have nothing to say." Much better than your original 21. 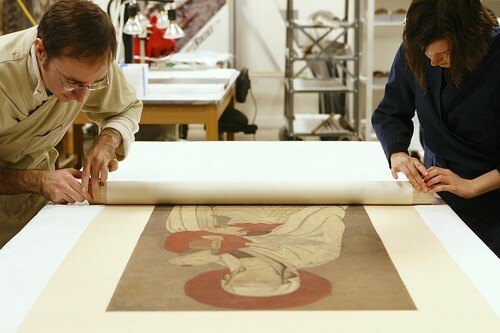 A Chinese watercolor of the Madonna and Child has recently been restored, and is thought to be one of the earliest pieces of evidence for Christianity’s spread in China. From the Chicago Tribune:"Though the delicate watercolor of a Madonna and Child is among oldest visual evidences of Christianity in the Far East, the museum had prosaically dubbed it “catalog number 116027.” For decades, it sat in a dimly lit case, cracked and soiled. The details were hard to discern. "...In the scroll's lower left corner are two Chinese characters representing the name of a famed artist, Tang Yin, who lived from about 1470 to 1523. 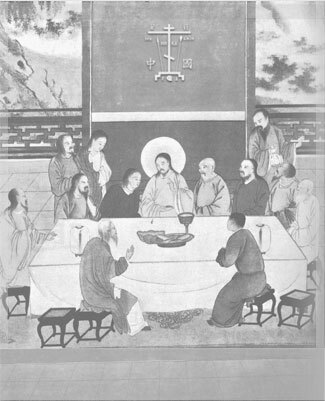 Because that was before the Jesuit period, Laufer decided the signature was a forgery, subsequently added to protect the painting's owners during a period when Christianity was suppressed in China...First, scholars noticed a striking similarity between the scroll and a famous painting, "Salus Populi Romani," in a church in Rome. It seemed likely that missionaries had carried a copy of the earlier work to China, where it, in turn, was copied by the scroll's artist. Arnold said that prototype arrived long before Laufer's date for the scroll. She explained that since his time, scholars have become more aware that the Jesuits weren't the first to missionize the East. 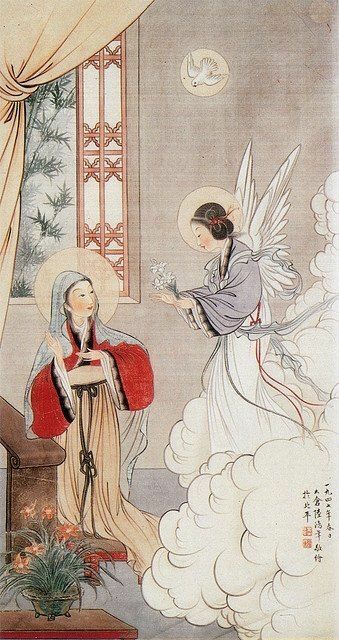 The scroll, she added, shows that cultural transformation: Guanyin has morphed into the Virgin, and Jesus has been transformed into a Chinese infant. Arnold thinks Laufer got it wrong: the signature on the scroll truly is that of a 15th-century artist. To her mind, it shows that China had incorporated Christian ideas by that period. So then you are saying that while Roman style looks foreign to the Chinese Byzantine fits them better and looks less distant? By contrast you would certainly think that Roman style suits Westerners and that Byzantine style will not suit them? I wonder why the Roman form looks unfitting for the Chinese whereas the Byzantine one does. Yet, at the same time there was nothing about the Eastern Slavs which would make it suit them either. They could easily have gone down the Catholic path. In fact Poland could have been Orthodox yet today it is Catholic. It is is interesting. Do you believe that the world is inherently divided into eastern and western zones, so that some people will naturally incline one way, while others will incline in another direction? I thought it was all geographic. You mean the Constantinopolitan? (given the Vatican world view, I don't think the Byzantines ever reached China). I wasn't saying that then, but I'll say it now, because it is true. Who you calling Westerners? The Constantinopolitan style suits the Russians, Romanians, Serbs, Bulgarians and Greeks, for instance, just fine. I wonder why the Roman form looks unfitting for the Chinese whereas the Byzantine one does. That's an interesting historical question. It might be that Greece and Constantinople laid the foundations of their world civilization and continued it on, whereas Latin Rome worked/s to get from under the shadow of its civilizers. Russia and Ukraine might have fallen prey to Westernization through a related cause. Yet, at the same time there was nothing about the Eastern Slavs which would make it suit them either. They could easily have gone down the Catholic path. In fact Poland could have been Orthodox yet today it is Catholic. It is is interesting. Do you believe that the world is inherently divided into eastern and western zones, so that some people will naturally incline one way, while others will incline in another direction? No, it just happens that way. I thought it was all geographic. Almost completely populated by people of non-Polish descent. I never called those peoples Westerners. I was asking why if the Byzantine style is fine for the Chinese is it also not fine for the Germans, French, Spanish and English? In that case why is the West such a small section whereas the east is given the whole Asian continent with the various peoples there, many of which have nothing to do with each other. What separates the West from the east? Also how is Roman or Latin culture more fitting for Germanics than Greek? What separates the West from the east? I also know similar joke but I won't write it here since it's kinda racist. Not according to the numbers of the last census. Not to mention the interwar census. Odd, given the bond between the original Grand Duchy of Lithuania and the Rus' that no Orthodox or GC Lithuanians are recorded, but almost half a million Poles each are (the numbers were actually higher-the 1931 is admitted to have counted down minorities of all sorts. Which, of course is why the Second Polish Republic ended up like the First Polish Republic-in oblivion). Constantinopolitan? Same reason Chinoiserie isn't. (Byzantine exists only in the West and among the Westernized). You're the one saying the Russians aren't Western. They went so far East they reached the Far West. The culture of East Rome was fine for the Goths in the Balkans and Crimea. The West Germans integrated themselves into Latin Rome. Chinoiserie is not acceptable because it comes from China and that is thousands of miles away from Europe. It is truly distant and foreign. Constantinople is much closer. They did not belong to Latin civilisation so how can they be considered Western? So do you believe the converts from Western backgrounds should go mostly to Western rite? They are both quite obvious to someone with long experience in Chinese culture. 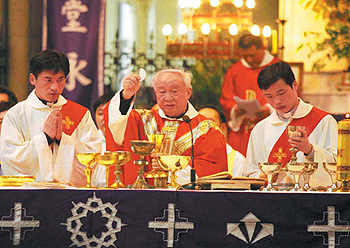 The Chinese in the pictures you show look equally in-place/ out-of-place in Western and Eastern liturgies. The European West-East divide is irrelevant to Chinese culture. Interesting, they must be then hiding somewhere. But wait, this table speaks only of the language, not of a nationality or an ethnicity. I guess this clarifies something. If isa's disagree with reality, worse for reality. "this table speaks only of the language, not of a nationality or an ethnicity"
LOL. You deny any connection? As for hiding, since the census was taken over 80 years ago, more than the life expectancy of the lands covered, and after a World War tramping back and forth through, I should think that most are hiding in a grave somewhere (I won't speculate where in the other world). Somewhere I think posted the recent figures. I'll look around. This census is a falsified piece of crap. Luka did not talk about nationality or language. He talked about descent. Chinoiserie is not acceptable because it comes from China and that is thousands of miles away from Europe. Chinoiserie comes from Europe. I don't know of any in China (though it might be, especially in Hong Kong, Peking and maybe Shanghai). It is truly distant and foreign. Constantinople is much closer. "Byzantine" doesn't come from Constantinople. It comes from Franfort and Paris. I don't equate Latin with West. For one thing, the Latin sources of Western civilization claim Greeks origins in the East. I see no reason why they have to go to Eastern rite. Look, you don't need to give me figures that I am already acquainted with. Of course there is some connection between language and ethnicity/nationality/descent. But in Poland this connection means that people of foreign descent use Polish langauge since it's the only official language (let's forget Kashubian for now). That's all. Polish Orthodox Church is hardly Polish, the faithful speak Polish, yeah, but when someone speaks of his Polish Orthodox identity (and the person speaking is not a convert) it starts a controversy because it is assumed that as an Orthodox believer, he has non-Polish ancestors (whose heritage he therefore betrays). Period. I think we agreed about that. But since that is so, with its aim of projecting a monolithic Polish nation of the Vatican's Latin rite, every deviation is from that is an admission a reality it is hiding. "Roman Catholic" Ukrainians and "Greek Catholic" Ukrainians and Lutheran Ukrainians are OK. But Orthodox Poles, no matter how small the number, present an existential problem to that monolithic vision-even the existence of Lutheran Poles can be swallowed before that. Yeah, I don't deal with fairy tales of descent being based on DNA in such matters (in the case of Poland, I suspect I can claim as much, but why should I get priority over you, someone a Polish citizen but not a Pole?). The szlachta would be very hard pressed to show exclusive descent from Lech, and I'm not sure they ever made that claim. If having non-Polish ancestors disqualified one as a Pole, I dare say few if any Poles would be left. Period. And, btw, in that case, give the Ziemia Chełmska back to its rightful owners. You claimed that West-East divide was irrelevant period. Have you forgotten? The East/ West divide is exaggerated and is getting more irrelevant every day. Westerners going to Eastern liturgy is just fine. WR is such a tiny niche anyway that most Westerners don't even have an opportunity to visit a WR parish. Btw, I never claimed the in-place/out-of-place was essence over degree. Then why do you keep quoting it? because it testifies in spite of itself to the existence of the Orthodox Poles. As in many nations. I agree completely. Still for some Orthodox people in Poland if someone has non-Polish descent he will stay Byelarussian, Ukrainian etc. for the ages of ages. It's not the problem with the Polish acceptance of the existence of the Polish Orthodox faithful, but with the emphasis on connection between the Orthodox faith and non-Polish descent among the Orthodox themselves. It's not that the Poles believe there exist only Poles that are Catholic (that's now rather outdated and an object of ridicule). It's that the Orthodox sometimes believe that the only Poles that exist are the Catholic Poles. If some Orthodox declares himself to be a Pole, it means he has some problem with his faith and surely he's on his way to Rome. If some Orthodox declares himself to be a Pole, it means he has some problem with his faith and surely he's on his way to Rome. It means he is ashamed of his roots. That's all. For every one American convert searching for a Western rite, I'd wager there are hundreds more who are simply searching for Orthodox worship in the English language. And it'll stay that way as long as WRO is treated as an exception and concession for those who are unable to man up and become Orthodox. I will concede that if you're an agnostic, perhaps rite is less relevant, but not irrelevant. We're going to have a rite no matter what, that I know. The byzantine rite reflects a particular cultural experience, the roman latin rite reflects another particular different cultural experience. The respect shown toward the rite reflects the respect shown to the culture it came from. At the heart of it is this - to the extent that the roman rite is not taken seriously, I as an individual whose ancestors lived and were shaped into fine people through that rite (and spoke latin based language), do not feel respected. 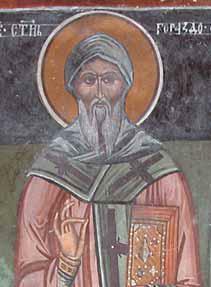 At the same time I would like to apologize for the westerners who showed likewise disinterest toward those whose tradition was alexandrian, byzantine, armenian rite, etc. Neither form of disinterest and or "prejudice" (I dont mean anything too intense by the word) is beneficial to society. However, I also think that when there is a single Orthodox jurisdiction and primate for the entire United States of America - that will do much to alleviate some of the current issues, especially where practices between antioch and ROCOR are not aligned, and they do need to align. The Western rite needs to be more uniform within the Orthodox Church, the more it is united, the more gain and trust can be found within it. Sadly, when many of my friends or aquaitances refuse to take the western rite of the Orthodox Church very seriously it is hard for me to continue being the exception. Frankly a united Orthodox Church in the USA is a necessity to gain trust of potential converts. I dont want that unity to come at the expense of more "liberalism" amongst prelates or unnecessary angst, but I am convinced that it is necessary for the continued growth of the Orthodox Church in North America, despite whatever challenges it presents. Until there is a single jurisdiction for the Orthodox Church in North America - I do not feel that the Orthodox Church is competent to manage a Western rite vicariate very effectively. A minority within a minority of bishops who dont fully understand it..is asking for heartbreak. 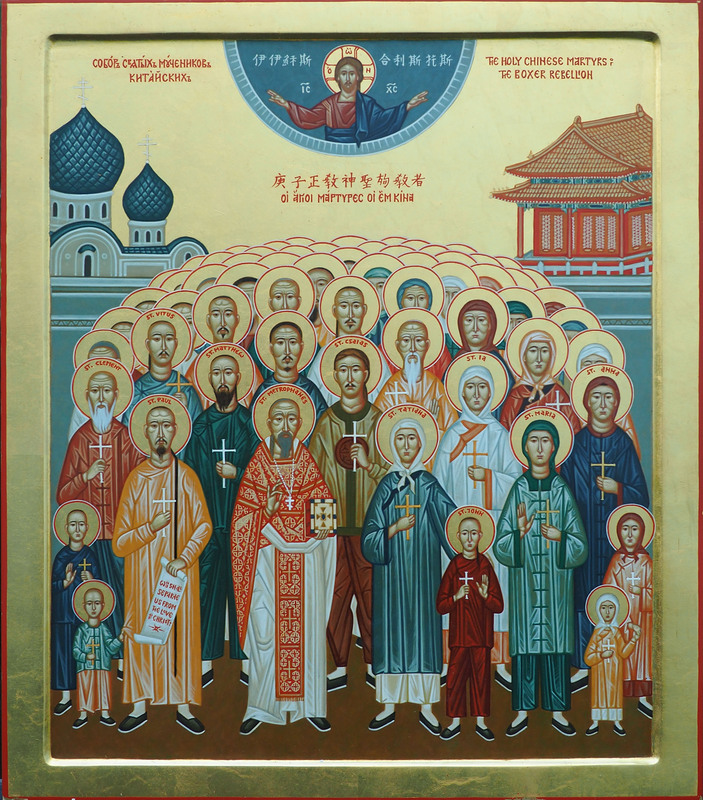 I love the picture of the little baby kissing the image of the chinese Orthodox Martyrs. I will always be an advocate more for the Eastern Churches in Eastern Asia, but yes it is true. If I were not of western european cultural background or middle eastern etc, preference toward a particular rite would be less. I am upfront that I do have a bias for the the roman rite, it's like a family member to me, I can't send it far away never to be seen against very easily. Fr. Gabriel Bunge's comments posted by sleeper are very meaningful. Yeah, no ones ever going to convince me that Rome is a hopeless mess, even though it is in a state of crisis. 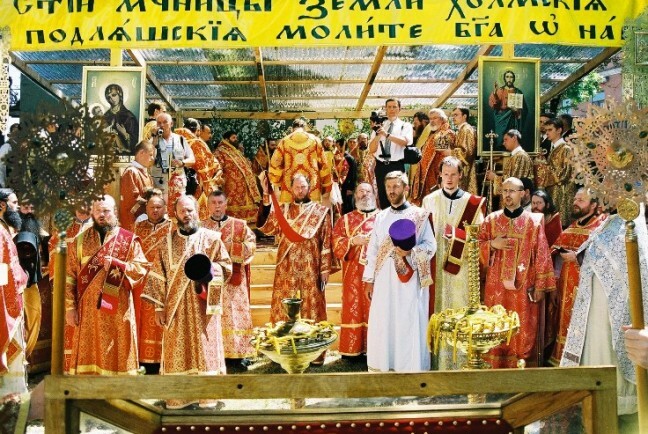 I think many westerners including myself, if they can divorce themselves from "the True Church:" etc....are going to have to stick with Rome/SSPX etc...if they need to live in a happy roman liturgy land, the Orthodox Church is not a very feasible option in my opinion. If you can't handle the byzantine liturgy as the norm, being Orthodox is really hard - and vice versa toward the "eastern catholics" although there are still many many more of their churches in the USA than western rite Orthodox ones. Though I do sympathise with the fact that the average byzantine liturgy is far more healthy than the average "new mass" of vatican II. That is a simple truth. This really isn't that hard. Polonization, or the incorporation of people into an ethnic Polish nation, has been going on since the days of the Rzeczpospolita. After Poland regained its independence in 1918, and particularly post-1926, this practice continued apace. The easiest way to Polonize people is to get them to speak Polish and be Roman Catholic. The 1931 census reflects an ambitious attempt to classify whole hosts of non-Poles, such as Belarusians, Ukrainians/Lemkos, etc., as Polish-speaking; a first step, if you will, to their Polonization. The Second World War interrupted those plans but, of course, after the War, disruptions of a different sort emerged. Even from the 14th century in the lands of Rus' conquered by Kazimierz Wielki, separate overlapping dioceses were set up for the Latin-rite Poles and the Greek-rite Ruthenians. Poles speak a West Slavic tongue and are culturally distinct from their East Slavic neighbors, although there is enormous overlap in many customs, words, etc. So, while there is a Polish Autocephalous Orthodox Church, its membership has historically consisted almost entirely of the ethnic minorities who reside in the state of Poland. The historical church of the Polish people, if such a thing can be said to exist, is the Latin-rite Roman Catholic Church. It is a sad thing that the two are no longer in communion. There is some evidence that intercommunion existed in the borderlands into the first part of the 15th century, at least. Here, where east meets west, is a tremendous setting for understanding and the bridging of ancient theological and cultural divides which has been sadly neglected. Yes, Yury, border areas are fascinating bridges of ecumenism, rightly or wrongly. There is some evidence that intercommunion existed in the borderlands into the first part of the 15th century, at least. Not intercommunion. Rather jumping the fence multiple times depending on the situation. I know that there was a lot of flip-flopping. It appears, however, from the New Catholic Encyclopedia, at least, that the Diocese of Przemysl may have been in communion with both Kyiv and Rome as late as the year 1416. At any rate, I believe that the people in the villages probably had little to no conception of the split at that point. No, the Vatican ordered the Polish king to set up Latin bishops to replace the Orthodox bishops in Przemysl and elsewhere. They, of course, were in communion with the Vatican. At no time were the Orthodox in communion with Kiev at the same time in communion with the Vatican since at least the latter half of the 11th century, when the Metropolitan of Kiev, following Constantinople's lead, sent a letter to the Vatican denouncing its heresies. Someone brought this letter up again just recently here. I am aware that Latin-rite and Greek-rite hierarchies existed in Przemysl since 1375. However, how do you explain the statement in the Catholic Encyclopedia that the Greek-rite hierarchy remained in communion with Rome until 1416 when it went over to the "schismatics?" I recall that Prince Danylo of Halych had very good relations with the Roman Catholics, so it seems very plausible to me that the politics of the borders were not so neat. Except for one, all the Polish Orthodox (only one being a convert) I've known in person identify themselves as Polish, and nothing else. I've know Ukrainians in submission to the Vatican, but they identified themselves as Ukrainians-Polish was only an accident of birth and shifting boundaries. I've known lots of the Vatican's Latin flock in and from Poland, who can't-in fact, insist on the impossibility-of separation of their church from their nationality. you can see my many posts on that matter in the Politics section. Or he is Polonized. Or just a Pole. I am aware that Latin-rite and Greek-rite hierarchies existed in Przemysl since 1375. However, how do you explain the statement in the Catholic Encyclopedia that the Greek-rite hierarchy remained in communion with Rome until 1416 when it went over to the "schismatics?" Propaganda for their faith. In 1451 King Casimir recognized Met. St. Jonas' jurisdiction over all the Orthodox in the Commonwealth except the diocese of Halych and Peremyshl/Przemyshl, whose bishop a century and a half latter refused to sign the capitulation of Brest and help lead the opposition to it. I recall that Prince Danylo of Halych had very good relations with the Roman Catholics, so it seems very plausible to me that the politics of the borders were not so neat. yes, he toyed with the foul policies of the Palaelogi. He also, however, sponsored the rise of the very Orthodox Met. St. Cyril as Metropolitan of Kiev and All Rus'. Do converts to Orthodoxy have to be de-Polonized? We are not talking about converts. We are talking about cradles.